I’d love to remember who got me to add Fair and Tender Ladies to my wish list, so I could give her/him a heartfelt thank you. It really struck a chord and has been the best surprise of the year so far. I think this book is not as popular as it deserves because it’s stuck in a “romance”/“women’s lit” positioning (see the covers? ), which puts so many people off with its usual associations with everything soft, guilty-pleasure-y and… womanly. To break free of these constrains would do the book and us a world of good. I was reading an interview with Smith and she says that, although she’s proud to be a “Southern writer” and a “woman writer”, she’s more accurately an “Appalachian writer”. I agree – if anything, it’s the sense of place that really stands out. Fair and Tender Ladies is an epistolary novel of letters written by Ivy Rowe, a member of a large family of mountain farmers in the Appalachians. We follow her since she’s a precocious 10 year-old in the late 19th century, until she becomes a plain-speaking, feisty old woman. Her life is not what you’d call extraordinary, but her smart observations of heartbreak, loss, hard farm labor and child-raising, make everything incredibly meaningful and engaging. Ivy has a great sense of humor, loves telling and listening to stories and feels strongly about her heritage – it’s impossible not to love her. It was also really interesting to see Ivy’s language evolve throughout the years. I’ve recently read a string of novels that where really well written, but didn’t manage to connect me to the characters (Cutting for Stone, The Sunne in Splendor). Ivy got me from letter one and by the end I was crying like a baby, which also hasn’t happened in a while. One more reason to try it: it was on the books challenged, restricted, removed or banned! I don’t know how much of my fascination with this (audio)book is due to Kate Forbes’ most excellent narration. One thing is to listen to an Appalachian accent, the other to read it, so if you can, try it on audio. I have the edition to the right, but it’s been on my shelves, unread, for ages. Nonetheless, at some point I did read a portion of it, which is why I gathered it up (loving epistolary novels often, as I do), so I’m not surprised to hear that you enjoyed it immensely! It deserves another go! I wish some of the bloggers I follow would share some thoughts on it – pretty please? My mother was all over me to read this book for the longest time, but I avoided it because I thought the title was silly and the cover (mine’s the one in the middle) just didn’t appeal to me at all. For some reason I decided to pick it up a few years ago, and I loved it. I agree with everything you said here! I am now a total advocate for this book–I try to get everyone I can to read it! Have you read anything else by her? Any recommendations? I haven’t yet, but I have Oral History and Black Mountain Breakdown sitting on my shelf waiting to be read! Came across this review by chance – Fair and Tender Ladies is a book I’m always pushing on people. Ivy Rowe is still one of the best protagonists for me. I loved Smith’s handling of the passage of time, and I still remember the two elderly women who visited Ivy’s family when she was little, and told the old folktales, and how when she’s an adult, Ivy can’t help think that those old ladies are still alive and immortal. For some reason that part still sticks in my mind and it’s been years. 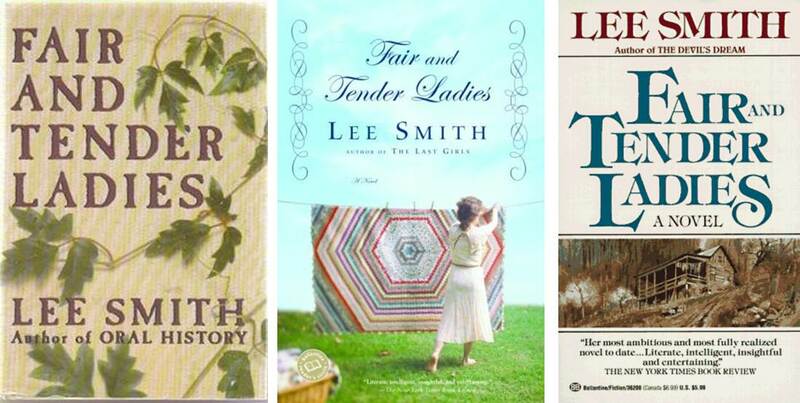 I’ve read four others of Lee Smith’s books since then. Of the four, I would recommend On Agate Hill the most, as it gave me a number of the same feelings as Fair and Tender Ladies, which still remains my favorite.